Today the door bell rang. I looked through the peep hole but I didn’t see anybody so I asked, “Who is it?” I’m home alone and I am cautious. I hear a small male voice go “It’s me!” I knew immediately and I opened the door. “Can Amara come out and play?” The disappointment on his face when I told him she wasn’t here shouldn’t have brought a smile to my face but I couldn’t help it. Amara had friends in our neighborhood! Now when I turn down our street to come home I get waves from all the kids. I’ve pulled into the driveway and had kids at my window before I could even get the door opened — just checking to see when Amara can come out and play! She spent a few hours with me the other day while her Mommy ran some errands. Two of the girls were home and the 3 of them had so much fun playing in the water. It was late in the day and the sun was going down fast so we dragged out the big pink tubs that had been used to ice down drinks for her birthday party — so glad her Mom and Dad hadn’t taken them home yet. We filled them from the hose and the girls used them as Jacuzzis. But Saturday morning was the best! Our morning started with the 2 of us making pancakes together. The night before she had seen pictures from Aunt Sandy of her cousin/pen pals visit. Her uncle had made them all pancakes in different shapes so she had pancakes on the brain when she got up. Our pancake shapes weren’t as good as her uncle’s but they were so much fun to make together and they sure tasted good! And as soon as breakfast was over it was time to go out front and play — hoping that her friends would all show up to join her. They did! The little boy down the street was the first to show up. He wanted to play in the water with Amara so I told him to go home and ask his Mom. This time she came back with him to me! She also stopped by later just to check on him. I felt good about it. Last time it was all about bubbles. This time it was all about water balloons! We had gotten some packs of balloons that were actually labeled water balloons. They didn’t work very well at all. They would burst before the kids were even able to fill them but Amara had stashed a big bag of regular balloons – left over from her birthday party and from Balloon Art and they were perfect for making water balloons. So the 2 of them started making water balloons with the plan to have a battle. I was the official tier of the balloons! 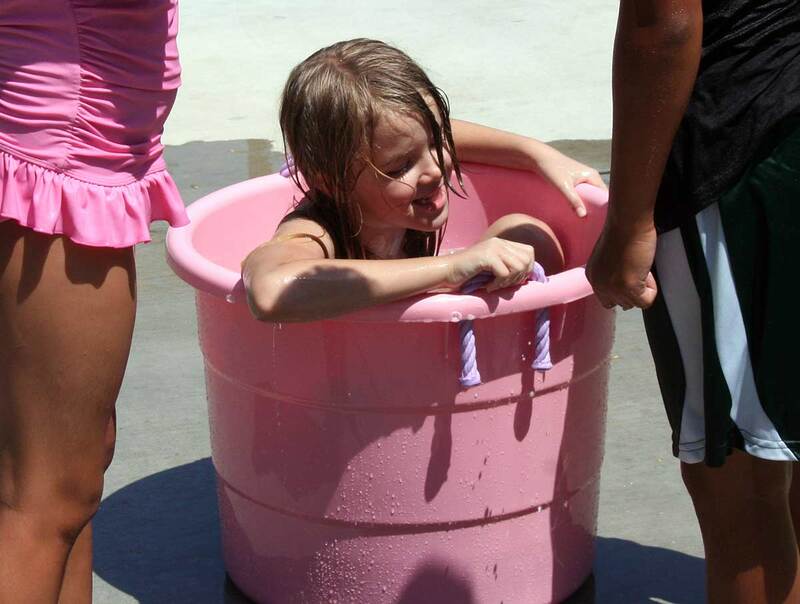 They would then put them in one of the big pink tubs — I love those tubs! For a while they put them in Amara’s little wagon and pulled them to the tub and then transferred them! They took turns and they both made the backup noise! And then the girls all showed up! So they filled more balloons and the battle began! There were only tears once when someone got hit a little hard in the leg. It was not a girl. When the water balloons were all gone the kids were great about picking up the broken pieces of balloon scattered all over the yard. One of them wanted to know why they had to do it NOW. I explained it was so none of the cats would get it and swallow a piece. That put it in Amara terms and she had them all cleaning up the yard — Grampy helped! When the balloons were gone it was Jacuzzi time and while I am starting to fill them Amara runs in to her room and gets bubble bath! I figure why not! It gave their Jacuzzis bubbles just like in a real one! I sent them all home cleaner than they arrived. And while all the kids were very well behaved there are only 3 tubs and 6 kids and so all I heard was “Grammy! Grammy! !” or “Grammy tell her it’s my turn!” From every direction and I loved it. Amara has taken to calling me Grammy all the time and so they all picked this up. This Grandma thing just keeps getting better! Amara was here again yesterday for a couple of hours. This time she wanted to play “Sorry!” and read with her Grammy. I have not been replaced I just now offer fringe benefits! This memory was posted in Outdoors Fun and tagged bubbles, cousin, Jacuzzi, pen pal, water balloons, Water Wars on August 23, 2011 by Grandma Kc. I love that it was not one of the girls that cried. That looks like so much fun. It reminds me of bathing in washtubs in my Granny’s yard out in the country when I was a kid. My son, also known as Uncle Nick, makes Star Wars pancakes for everyone when we gather at his house. Our Little Princess loves them. I love the photo of Amara in the tub. Such a cute girl! What a fun grammy you are, I should take notes so as mine get bigger so I can entice them over to my house! 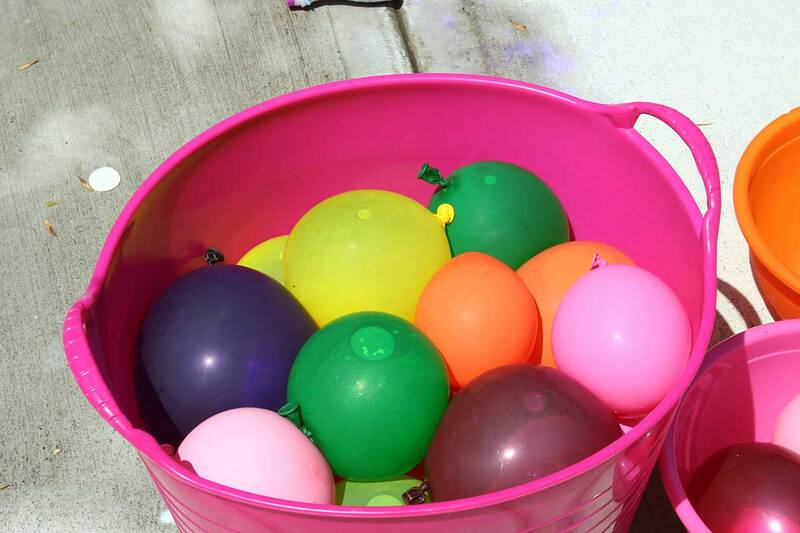 I’ve had the same experience with water balloons–the one designed to be water balloons break too easily. I mentioned your idea about painting with sidewalk chalk in my blog today! Cute ending to the post, Grammy. I’m not surprised that you’re such a wonderful Grammy to not only Amara, but now the entire neighborhood. You’ve always been a wonderful sister to me!! Love you!! What a wonderful neighborhood, and how special for all involved! Such memorable times! I really enjoyed this post. Reminds me of my own neighborhood growing up. I thought it was great that the mother came down the first time with her child and then came back to check up on him again! My kind of mom! Wish I had had a Grammy like you growing up! You are indeed special! Good times- kids, water and balloons. I fill up every big bucket I have and it always cracks me up how they are not willing to just play with the water, but MUST get in it, no matter the size. How sweet that you will always be a sweet memory to all those children. Love this! This is how I grew up…having friends that lived in my Gma’s neighborhood! And now mine have kids around here to play with when they visit!I text with the moms to give them heads up when one or more will be here. I’m comfortable with gal across the street to have her son here/my grdson there. But others not! Kids play in cul-de-sac or yards where eyes can be on them fulltime. My daughter has taken to asking HER neighbors “do you smoke, have pets, guns, stay engaged with kids?” I applaud her of course, but sad that we even think like this these days. For now, I’ll keep them all in my yards….and they can swim together come pool time. What a lot of fun for Amara & her friends. Too cold here now for water balloons. Maybe next summer we will try it with Lucy and her friends. I love this! It’s the simple, but fun activities that make the best memories! Mostly around here we just have good old fashioned fun! Helps that we live in a wonderful climate – unlike Michigan and Illinois! I tease your Mom a lot about the weather!